The Book of Lamentations provides the greatest insight into the struggles true believers in God will face, and the promise of salvation that He offers. 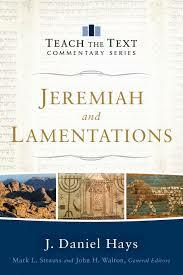 This is a topic suggestion on Books of the Bible: Lamentations from Paper Masters. Use this topic or order a custom research paper, written exactly how you need it to be. While Lamentations is a very sad piece of text, the promise of a better life than this earth can provide is incorporated into the writing. This hope for an eternal paradise is one true believers in Christ carry with them throughout their life, for God has always promised an end to all suffering. This particular book of the Bible is most interesting for two reasons: its structure and its application. The first four poems contained in the text are acrostics, whereby the first letter of each verse begins with a letter of the Hebrew alphabet in order. While it is unknown why the passages were written in this way, it is apparent that there was great complexity in its planning and writing. Secondly, the book is interesting for its use in modern-day religions. Various branches of the Christian Church use the Book of Lamentations in various religious events during both important holidays and traditional services. Additionally, the book is recited on the Jewish holiday of Tisha b’Av as well as on other holidays to commemorate hardships in the history of the Jewish people. To this very day, the Book of Lamentations is used each week by Jews in Jerusalem as they mourn the past destruction of the holy city, shedding tears on the Wailing Wall in the process. The concept of mortal suffering in the name of eternal salvation is not a new idea to Christianity and Judaism, but the Book of Lamentations provides the clearest explanation of the hardships of the various believers and the hope for salvation yet to come. Romans - The Book of Romans was written by Paul the Apostle as a letter to the Church of Rome dated back to about 60 A.D.
Psalms - One of the most eloquent books of the Bible, the Book of Psalms contains 150 poems, representing the entire range of religious behaviors that one should embody in order to effectively practice their faith. Paper Masters writes custom research papers on The Book of Lamentations and explains the greatest insight into the struggles true believers in God will face, and the promise of salvation that He offers.